Zoos are popular destinations for most families and students. They function as wildlife conservation parks and usually feature animals like zebras, giraffes, elephants, and other jungle animals. They can also contain the country or city’s national animal like the grizzly bear of Yellowstone park. 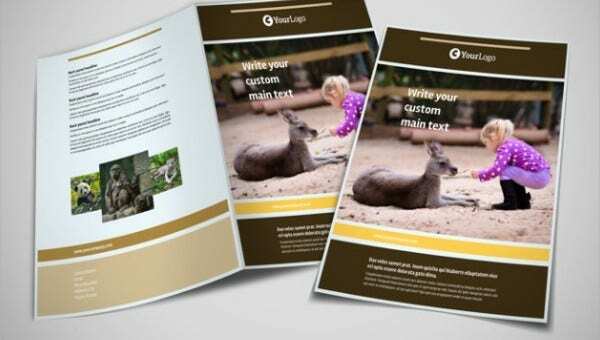 Regardless of the kind of animals in your zoo, you can use our zoo brochure template to let your visitors learn more of the animals you protect in your zoo and the significance of each. You can also showcase recreational activities in your zoo like feeding peanuts to elephants or picture taking with the pandas. 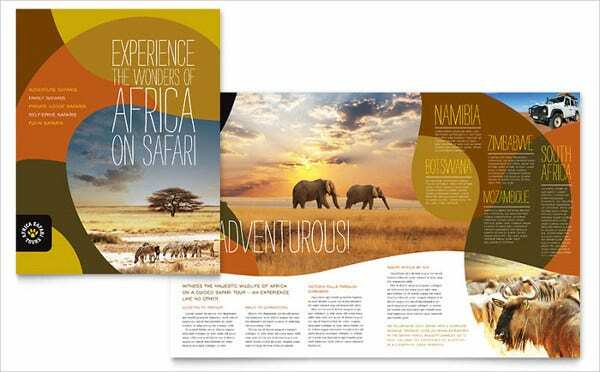 Check out our brochures below. 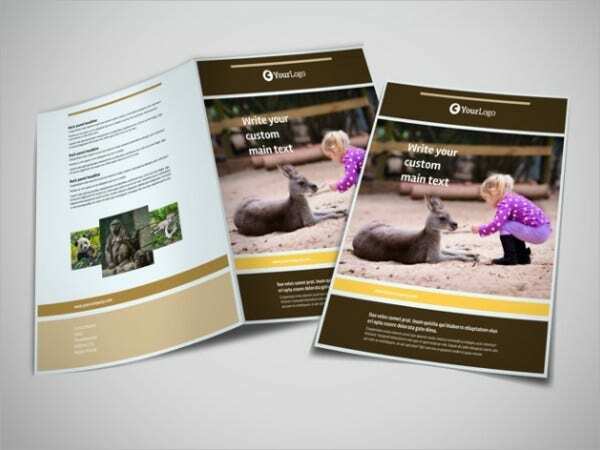 Give your guests a grand tour of your zoo with the aid of a zoo map that let’s them explore areas of your zoo and engage in activities that they’ll treasure in a long time. 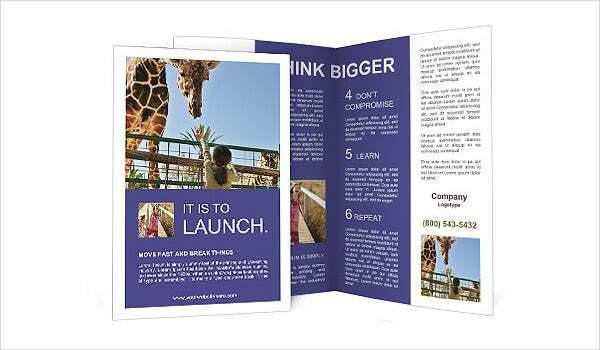 Give your guests a walk through of your zoo using our HD brochure and bi-fold brochure template samples that’ll serve as their guide for an organized field trip with students or a family vacation tour. Offer complete services even on holidays and weekdays. Some visitors might get turned off with some other services like the zoo gift shop being closed for maintenance or during regular holidays. Give a freebie. Give your guests something to take away in appreciation of their time to visit. Not necessarily monetary in value, it could be a valuable learning or a coupon on their next visit. Make attractive signs. Signs guide the way for visitors, so make sure to make them eye-catching and readable. Display large animals. Zoos are like a circus show for some guests, so make sure to feature large animals like elephants. Add some animal art pieces. A zoo isn’t just for storing animals; it could also contain unique art structures like dinosaur structures, mammoth bushes, and other animal structures and shacks that will be a good area for playing and picture taking. Add a special zoo event. Celebrate Halloween with a trick-or-treat activity at the zoo or celebrate Earth Day by giving discounts to students. 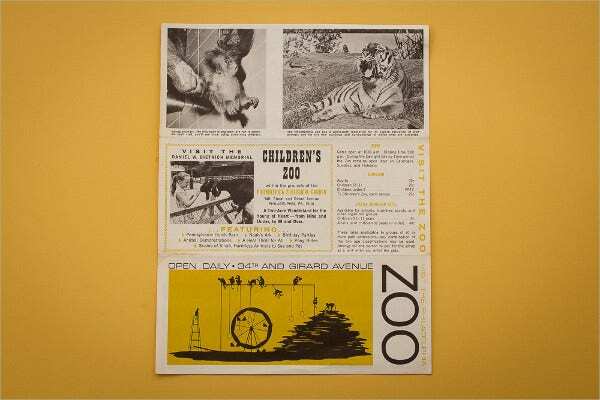 Make a zoo membership form. If you have regular visitors, give them a treat by letting them sign up as a member of your zoo club. Have a zoo tour guide for larger crowds? Let your zoo guide lead the way to a amusing zoo experience by incorporating these engaging zoo activities in your own zoos. You can even include these activities in your brochure. I Spy Game. Get them hooked as to how many and what kind of animals are in your zoo by playing the I Spy Game. Make sure that they fully describe the animal. Scavenger Hunt. 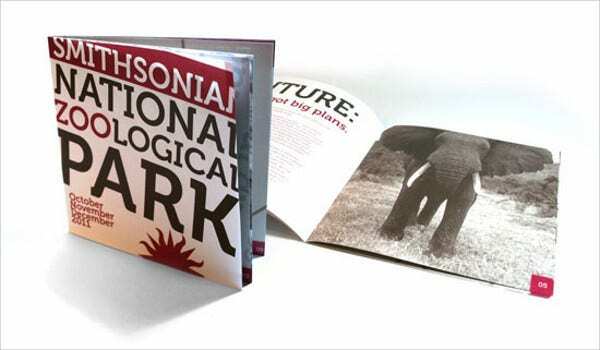 It’s like hunting for animals, only you are hunting for clues as to which animal is in your brochure puzzle. Zoo Crossword. Get the bigger kids to identify which animal is being described in the crossword. Zoo Bingo. Instead of numbers, you can place a animal face on the squares and draw out a ping pong ball with the face of the animal stuck to it. 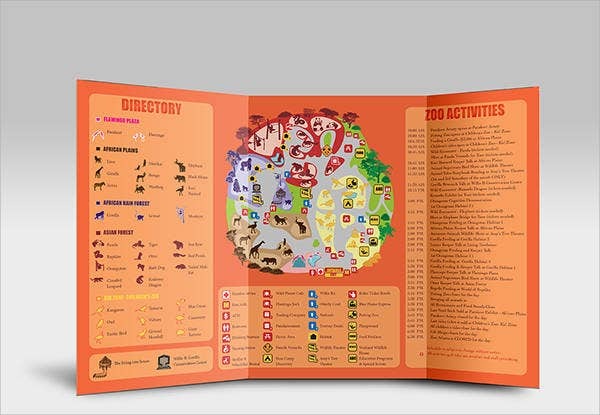 Our zoo trifold brochure can also be used as an interactive map where you can place some of the games we suggested. 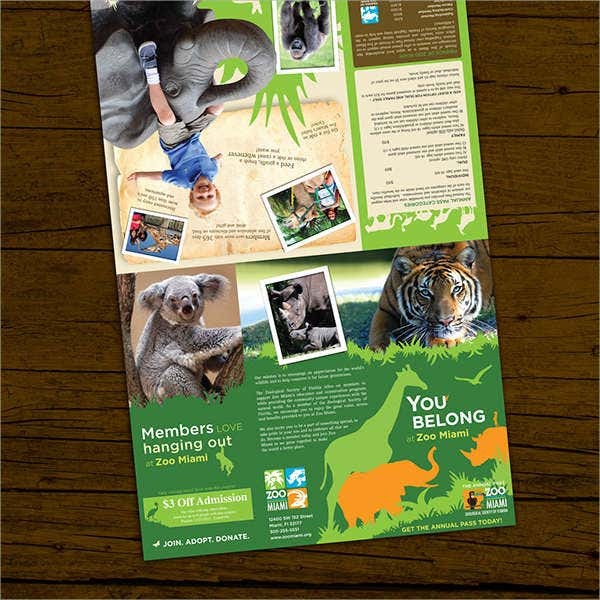 You may also actual photographs of our zoo animals and visitors on your brochure to encourage more future participation. 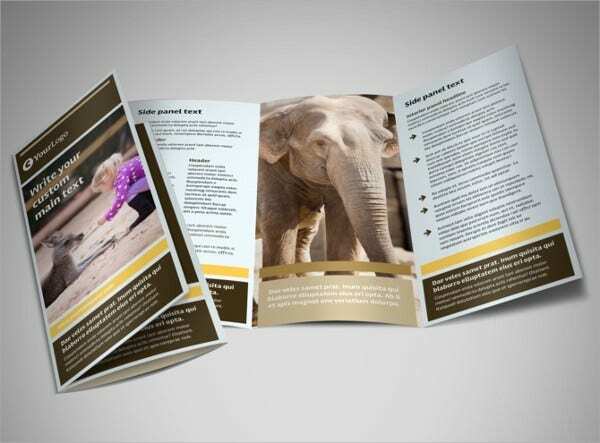 Design your brochures with ease and personalize your design with our beautiful zoo brochure templates.